You don't need to spend tons of money on expensive and beautiful spinning wheels and accessories to spin your own yarn - just a couple of easy to find things to make your own. Spinning sheeps wool and other natural fibers only requires a way of turning the fibers around themselves to hold it together. Sheeps wool has little hooks on each strand, so it's easy to get it to hook on (like Velcro) and form yarn. One of the easiest ways to diy your own tool is with some kind of stick (like a pencil or dowel) and a disc (how about a cd). 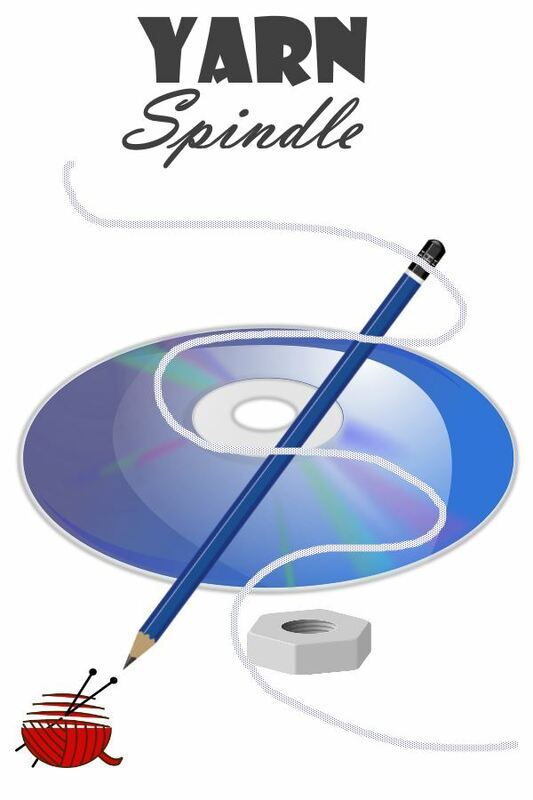 Combined with a few other bits and pieces, like a washer or a nut big enough to seat on the dowel or pencil to hold the cd in place, and you're off to the races, spinning your own fleece into yarn to knit with. A length of yarn is tied below the disc, and comes up over the disk to the top of the dowel. You can cut a 'birds mouth' into the dowel to hold it in place, around an inch or so below the top of it. This yarn gives the fleece a place to grip onto, to get it started. The weight of the spindle is enough to create its own momentum, keeping it spinning for a while to give the yarn enough twist to hold together. Once you get enough of it spun, wind it around the dowel and keep spinning. Once the spindle is full, wind it off into a ball or skein to free it up to go again.